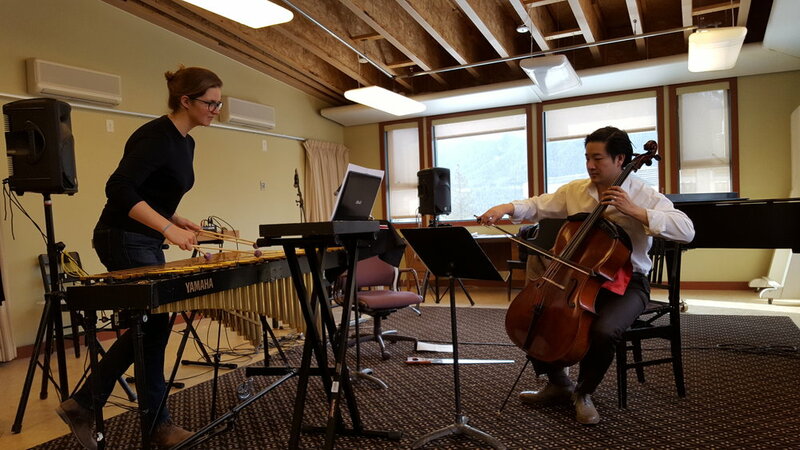 The last three weeks at the Banff Centre in the 'Concert in the 21st Century' residency program have been full of adventuring, thinking, making, composing, designing and experimenting. Pedja Muzijevich and his team of guest faculty have helped bring new light to how we as musicians can harness the shift in modern audience patterns in a positive way, by presenting concerts in the 21st century that engage and create new viewers and participants in our art. Jared Yapp and I have watched as our plans and ideas for the Climate Change Music project have grown and developed into something we couldn't have imagined before we arrived. We now feel part of a larger community of musicians and artists from around the world and cannot wait to start bringing the project with Ad Lib Collective and Penny Quartet to life in Melbourne this year. One of my goals during my time in Banff was to rewrite my piece Sounds of the Reef for musical saw, vibraphone and cello. It was fantastic to have the chance to workshop the piece with our next guest artist Adrian Fung, cellist from the Affiare quartet and Vice President for Innovation at the Toronto Symphony Orchestra. Pedja decided to include the work in our next residency program for an intimate performance at The Club in the Banff Centre. It was exciting to present the work for a public audience and receive feedback and support. With a few small tweaks, the final version of the piece will be officially premierred by members of the Penny String Quartet at the performance of this project in Melbourne in May. Bow and Hammer are well know in Chicago for their collaborations with chefs, farmers, distillers and brewers in interdisciplinary performances that invite audiences to take part. 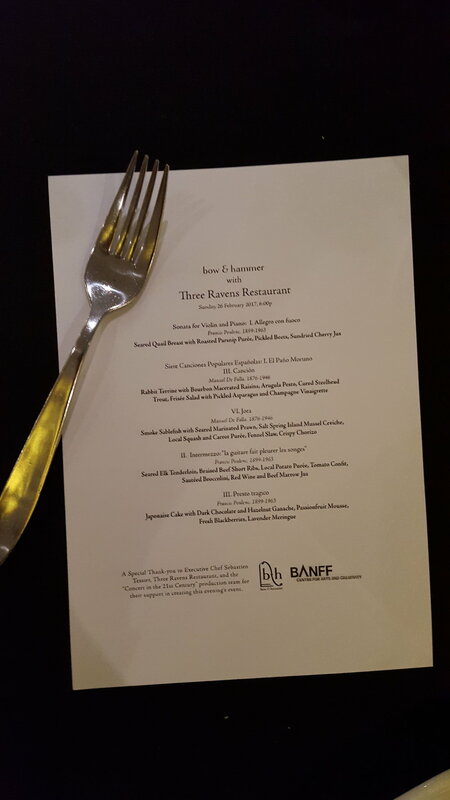 Their project as part of this residency program was to collaborate with the chefs at the Three Ravens restaurant in presenting a five course meal featuring food and music especially paired for the event. Watching the sun set over the mountains as we listened to Poulenc and ate delicious food, was an amazing way to end our second week. Some of the other projects on the residency course included Chloe Weston's meditative take on Brahms solo works for piano with immersive projections, Fernando Bravo's work with neuro-science and music, a new take on curating vocal recitals by Ally Smithers; Adam Rosenblat's project explored Thierrey De Mey's Light Music for performer, movement sensors and projection; Ricardo Mateus composed a site specific group performance using pre-recorded tape cues. Ice Installation - Open Studio's Friday March 3rd. Alan Pierson, artistic director of new music ensemble Alarm Will Sound was our final guest faculty member. He shared his insights into running a large-scale touring new-music ensemble. Jared and I had the chance to workshop the ideas surrounding our project with him which helped give us a new perspective on our programming, arranging and composing. Our final performance for the residency was an open studio. Jared and I set up the ice installation that will be running during the program of works that we have been developing. 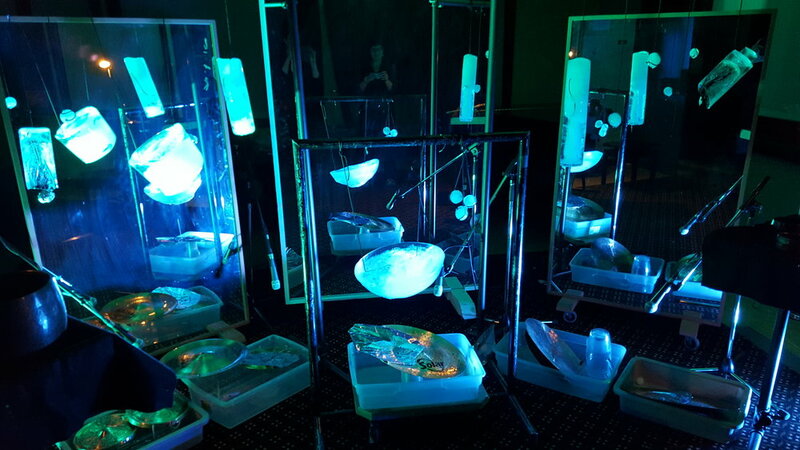 We froze the ice in batches outside overnight (minimum temperatures that week were between -20 and -12) and used cymbals, gongs, lighting and amplification to create an immersive sound world of dripping ice. The piece is a comment on how humans deal with climate change; for the most part ignoring the gentle dripping and melting of the ice until it directly punctuates our lives. Having the time to think and rethink our climate change project on a much deeper level than is usually possible has been a very valuable experience for Jared and I and certainly one that is going to influence my creative process for the rest of my life. It has been inspiring to be in a place that acknowledges the work that artists do and actively supports them to create and discover. I will miss all of my new Banff friends and am very grateful to the Banff Centre Music staff who were so supportive during our time there. I would also like to thank Stephen Whately for his generous support of this trip. It's great to be back home in sunny Melbourne again to begin work bringing all of our plans and ideas to life with the Penny Quartet for our performance in May. Stay tuned for more details. 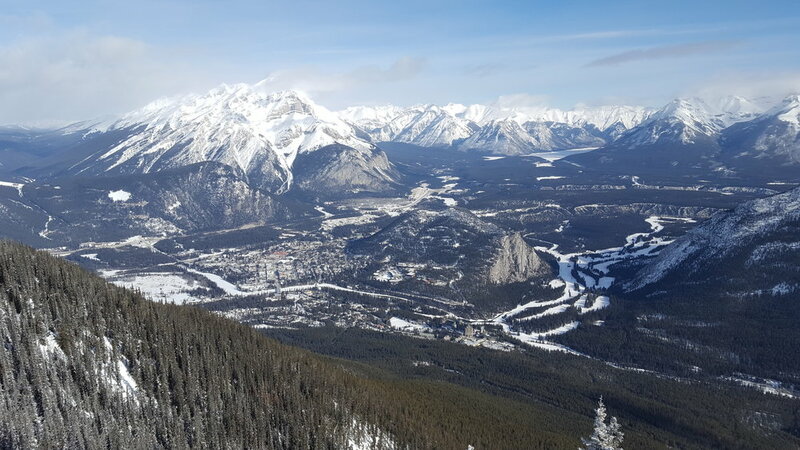 A view of the Banff Centre and town from the top of Sulphur Mountain. Improvisations during the ice installation for Open Studios.